I believe the most important for practical usage are Kitchen (40 months cycle), Presidential (4 years cycle), Juglar (9 years) and Decimal cycles. There are other long term cycles like Kondratiev (50-70 years cycle) and Kuznets (20 years cycle) as well. However they are too long. 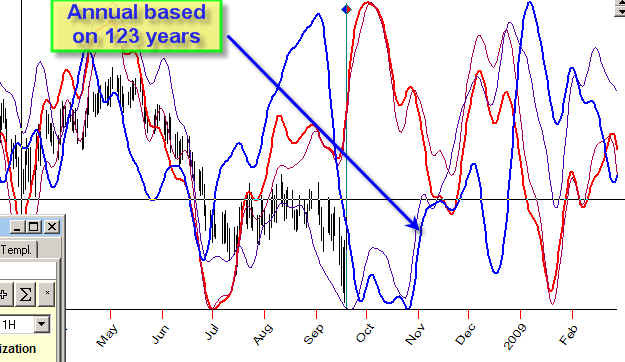 In Timing Solution it is possible to calculate these cycles. Do not forget that for calculation of these cycles you have to use as long price history as possible. For example, if you calculate Decimal cycle, you need to use at least 2x10=20 years of price history (better 30 years). Now I show how you may improve this cycle. 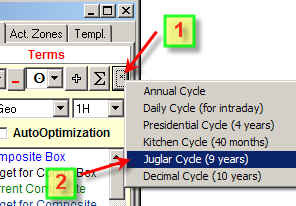 Another variation of cyclic analysis is Annual Decimal cycle. This is a variation of Annual (Seasonal) cycle though it is calculated differently. For example we can calculate the Annual cycle for the year 2009 using NOT ALL available price history but only XXX9 years, like 1999, 1989, 1979 ,,, years. 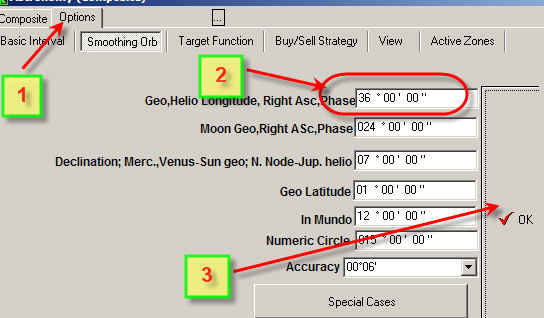 Thus to calculate this projection line the program will use the XXX9 year patterns. All other price history will be ignored. BTW, in the same manner you can calculate Annual cycle for leap years. Do not forget that you need to have enough price history to calculate these cycle. I have checked all most important economical cycles (+Annual) and have found that now (October 2008) the most working cycle is Annual cycle based on all available Dow Jones Industrial history.